I LOVE lemony things. Sweet, tart, light, refreshing. Yum. However, I'm not a big fan of Lemon Bars. They always taste egg-yolky to me. Blech. When I found this recipe on Pinterest, claiming to be nothing like a Lemon Bar, I wanted to give them a try. Imagine the moist, fudgy texture of a brownie, but bursting with bright lemon flavor! And then there's the sweet glaze...! (My only complaint: I didn't double the recipe!) Nom. nom. nom! 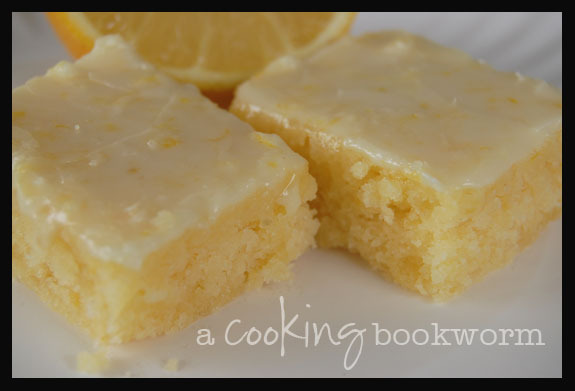 So, if you love lemon too...make these! Now. Preheat oven to 350°F. Spray an 8-by-8-inch baking dish with cooking spray and set aside. Zest and juice two small lemons (please don't try to substitute dried lemon zest and bottled juice. Use fresh! ); set aside. In a large bowl, beat the flour, sugar, salt, and softened butter until combined. Add the eggs, lemon zest, and lemon juice. Beat into the flour mixture at medium speed until smooth and creamy, about 2 minutes. Pour batter into pan and bake for 25 minutes, or until just starting to turn golden around the edges and a toothpick inserted into the center comes out clean. Allow to cool completely before glazing. When brownies are cooled completely, make the glaze by whisking together all three ingredients. Spread over the brownies, cut into bars, and serve! PrintRunner GIVEAWAY! Hurry! Ends Monday 5/28!